We are thrilled to announce the grand opening of our show home at Maes Rheithordy, Cilgerran. From Cardigan, Pontycleifion, at roundabout take 3rd exit onto A487, take 1st exit onto A478 signposted Tenby, turn left into Cilgerran Road, follow A478 on Cilgerran Road, see Cilgerran Primary school opposite our development, arrive at SA43 2TZ. From A40, Penblewin Roundabout; head west on the A40 towards Llandaff Row, at Penblewin Roundabout, take the 3rd exit onto A478, drive 1.8 miles, turn right, turn left onto High Street, drive 0.1miles, High Street turns slightly left and becomes Cemaes Street, arrive at SA43 2TZ. Come and join us for a tour around the show home, to see a finished article and get a glimpse of how owning a new build would suit your needs. Our Customer Service Coordinators will be able to highlight plots that are currently for sale and talk you through any optional extras that you may require. If the prizes were not tempting enough, we will be serving light refreshments for you to enjoy during your tour of the show home. How’s it going to work? Radio Pembrokeshire will have selected 5 players in the week running up to the draw. Don’t worry if you aren’t lucky as you can still be entered to the draw! Visit our show home by 2pm on Launch day and you can have your name entered to the competition – we will be randomly selecting 5 of our own ‘Wild card’ entries. 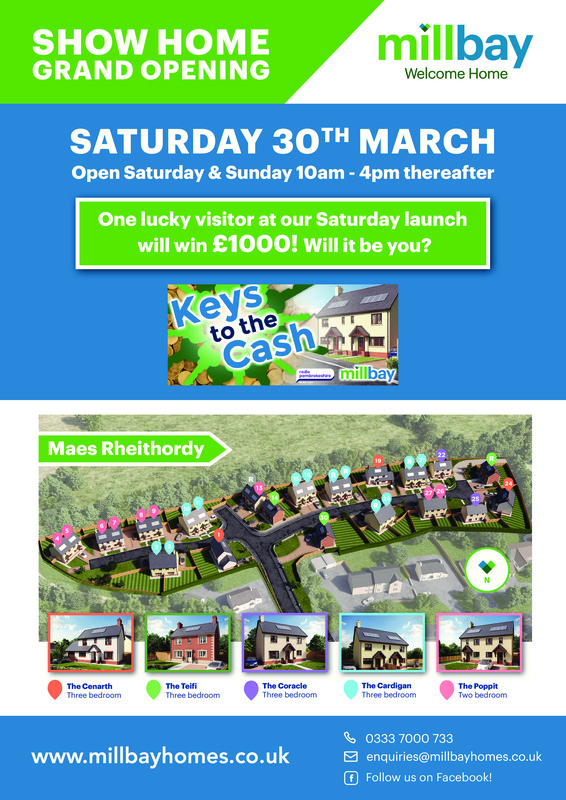 All 10 finalists will need to be at the show home by 2.30 when we will be playing ‘Keys to the Cash’ live on the radio.